TRAIL — The Trail community hosted their annual Fish Fry for Seminoles in Recovery on Oct. 13, bringing the community together to celebrate life and sobriety. 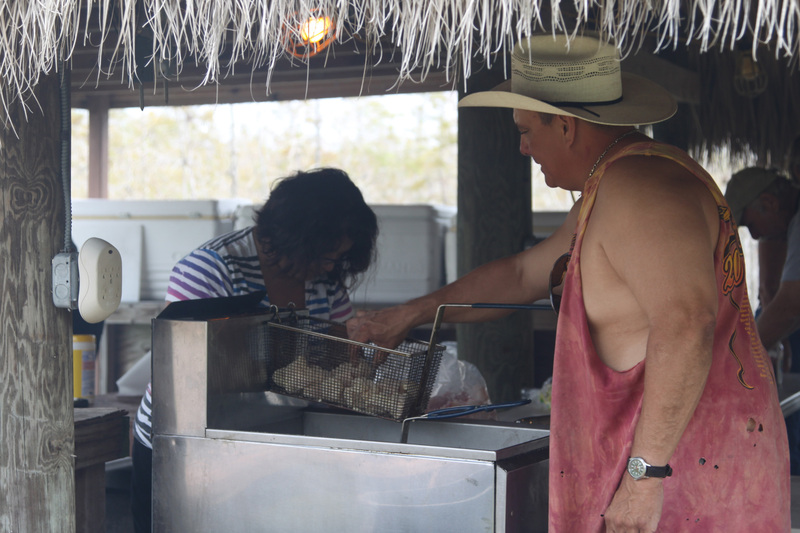 The fourth annual event, held at the Trail Independent Baptist Church with about 60 people in attendance, kicked off with a welcome address from Family Services director Helene Buster, while others started frying 100 pounds of grouper under the chickees. A group of Tribal members created Seminoles in Recovery in 1993 in an attempt to provide conferences and support to Seminoles with addictions, Buster said. Since its inception, the program has grown to include several annual conferences and events, including the Fish Fry, to promote camaraderie among people who seek help with recovery. Trial resident Jake Keyser started the Trail Fish Fry four years ago after attending a similar event in Tampa. The Tampa event, he said, showed him that he could have fun without alcohol. Alcoholics and Narcotics Anonymous meetings were both held at the Trail Fish Fry, during which participants read stories of recovery and shared their personal achievements. Fred Mullins, Family Services prevention specialist, said the events sponsored by Seminoles in Recovery show members that they can have fun without high-risk components and that they have support from other members of the community. “The event involves having fellowship and encouraging others in their commitment to sobriety,” he said. “The real goal is that people move from a systematic program to a [positive role] within their Tribe. The Fish Fry, which also had a waterslide for children and horseshoes for adults, raised money for the fifth annual Florida Native American Recovery Convention, a Seminoles-in-Recovery-sponsored event that brings together recovering alcoholics, narcotics users and gamblers to offer support and hope. The event takes place from Feb. 28 to March 3 in Clewiston. Seminoles in Recovery is now a nonprofit organization to help in that quest, she said. With another successful event completed, Mullins said they will continue to grow their operations and invite everyone to participate. The sixth-annual Hollywood Fish Fry will take place on Jan. 12 at Markham Park in Sunrise.